Japan’s Takumi Nakaya has won the 10th Asia-Pacific Amateur Championship with a two stroke victory over India’s Rayhan Thomas and compatriot and 2018 Asian Games gold medallist Keita Nakajima on Sunday. The 20-year-old, who was the highest-ranked Japanese player in the field at No. 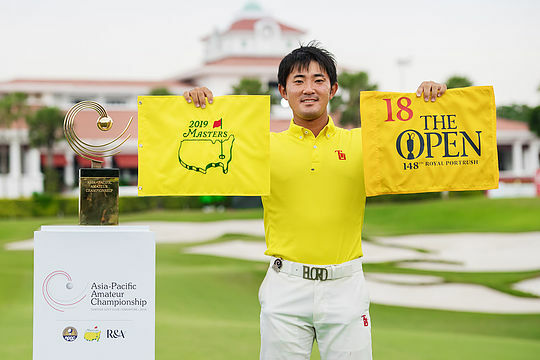 22, shot a 5-under-par 65 on the final day to finish at 13-under-par to earn an invitation to the 2019 Masters Tournament and a place in the 148th Open at Royal Portrush. “This is simply like a dream. I have been dreaming of going to the Masters ever since I was a kid,” said Kanaya. Kanaya capped off a 64-65 weekend at Sentosa Golf Club for the win with the runners-up Thomas and Nakajima receiving the opportunity to play in The Open Qualifying Series. Indonesia’s Lloyd Jefferson Go was fourth at 10-under after he managed one-under 69 in the final round, while KK Limbhasut of Thailand was next. Overnight leader Yuxin Lin shared the ninth position with three others after he faltered to five-over 75 in the final round. Min Woo Lee was the best of the Australian continent finishing in a tie for 16th at 3-under, ten strokes behind the leader. Zach Murray finished at 1-under for a share of 21st position, with Blake Windred at even for a share of 24th finish along with Dylan Perry. David Micheluzzi, who fired an opening round of 64 to be in the box seat for the tournament carded rounds of 71-69-77 to finish in a tie for 30th position. Shae Wools-Cobb was forced to withdraw from the tournament following the first round.